The ODROID-XU is a Samsung Exynos5 based development board. The Samsung Exynos5 Octa 5410 is truly unique in that it has both quad Cortex-A15 and quad Cortex-A7 cores in a single SoC. 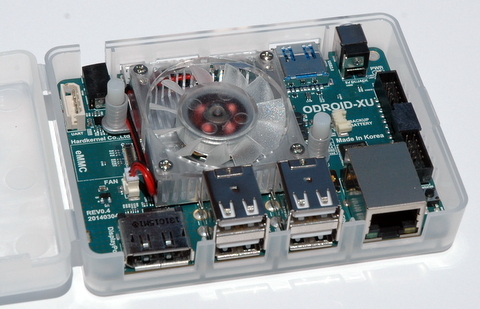 The ODROID-XU design incorporates support for HDMI, Ethernet, USB 2 & 3, and sound. The cooling fan operates only when needed. Loaded with features and packed incredible processing power, the ODROID-XU is one serious development board in a tiny form factor. This image uses the Ubuntu 14.04 core filesystem from Ubuntu with the minimal meta package applied. The kernel is compiled from the Hardkernel fork of the Linux kernel git repository. The result is an easy-to-install and stable Linux image. This image uses the Ubuntu 12.04 core filesystem from Ubuntu with the minimal meta package applied. The kernel is compiled from the Hardkernel fork of the Linux kernel git repository. The result is an easy-to-install and stable Linux image. This image is based on the Debian Wheezy 7.2 core filesystem from Live-Build, with packages equivalent to the Ubuntu minimal meta package. The kernel is compiled from the Hardkernel fork of the Linux kernel git repository. The result is an easy-to-install and stable Linux image.